Now that the new Moto 360 is out, no hacks are required. It works with the iPhone straight out of the box. 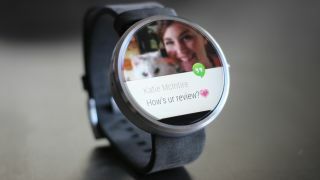 There's mounting evidence that Google wants to get Android Wear working with iOS, but it's likely that Apple will have something to say about that - and in any case the two operating systems don't play nice just yet. Or at least not officially, but there's now a fairly simple way to get the Moto 360 connected to an iPhone or iPad and it doesn't even require you to jailbreak or root any of your devices. You will, however, need access to an Android device to complete the initial setup. As shown by YouTuber Jeremy Judkins you start by downloading 'Wear Connect for iOS' from Google Play and launching it on your Moto 360. From that you turn on 'iOS Service', then head over to your iOS device and download 'BLE Utility' from the App Store. Launch the app, hit the 'Peripheral' button and then hit the menu option on the watch to connect it. After that you should start getting notifications from your iOS device. Simple. We should point out a few caveats though. For one thing this isn't an official solution, so not everything works properly. Judkins reports that notifications, answering/declining calls and the apps on the Moto 360 should work, but that you can't currently send messages from it. It's also hit and miss as to whether the Moto 360 will keep its connection with the iOS device and there are no guarantees that it will work at all, so we really wouldn't suggest buying a Moto 360 if you're unable or unwilling to use it purely with an Android phone. If you happen to have an iOS device as well though it's well worth a try and it may not be limited to the Moto 360. Although the video only talks about the Moto 360 the two apps which are required make no specific mention to it, so if you have any other Android Wear smartwatch you might as well give it a try too. The G Watch Urbane is one of the most stylish smartwatches yet.